Exquisite Details Stunning Finish. The Nobel 1.0 is a highly accurate, consumer-grade desktop SL Laser 3D printer with a print resolution up to 300 microns and a layer thickness of 25, 50, and 100 microns. It is designed to achieve superior print results for users of all levels at an affordable cost. UV Laser 405nm Class 1 certification with Product Shell is safe for home use and all enclosed design protects users from ultraviolet ray during printing, and ensures printing byproducts aren't released outside the printing area. 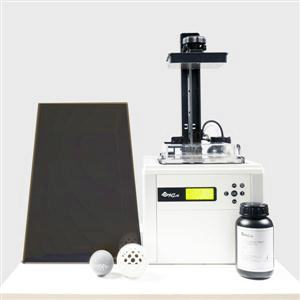 By improving the resin-filling mechanism, The Nobel 1.0 provides a stable SL printing quality so that users do not need to add liquid resin constantly throughout the printing process. The Nobel 1.0 is a plug and play 3D printer featuring a USB port, users can simply plug in a USB drive and press print. Few touches of the button, your prints come out perfectly.